G-Shock is introducing the new G-SQUAD series with six model of the analog-digtal GBA-800 featuring a Step Tracker (a.k.a. pedometer) and Bluetooth connectivity. 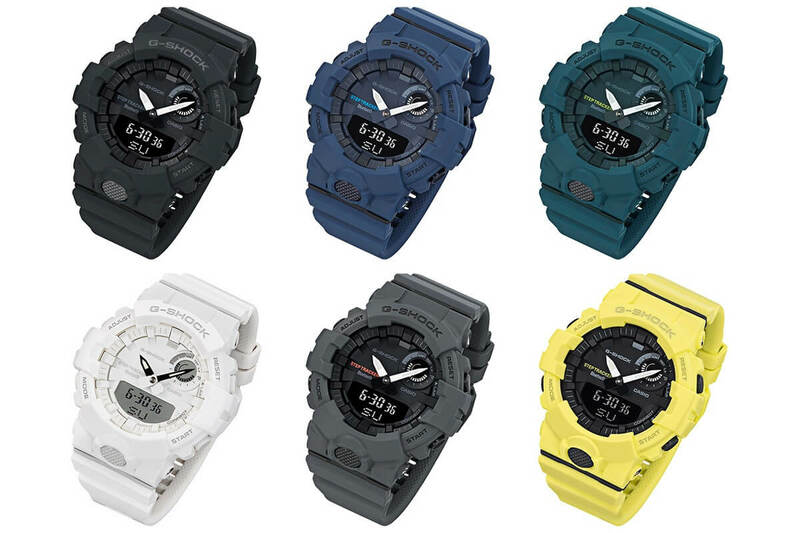 The six models include basic monotone configurations to match fitness clothing: GBA-800-1A (black), GBA-800-2A (navy blue), GBA-800-3A (teal), GBA-800-7A (white), GBA-800-8A (gray), and GBA-800-9A (lime green). 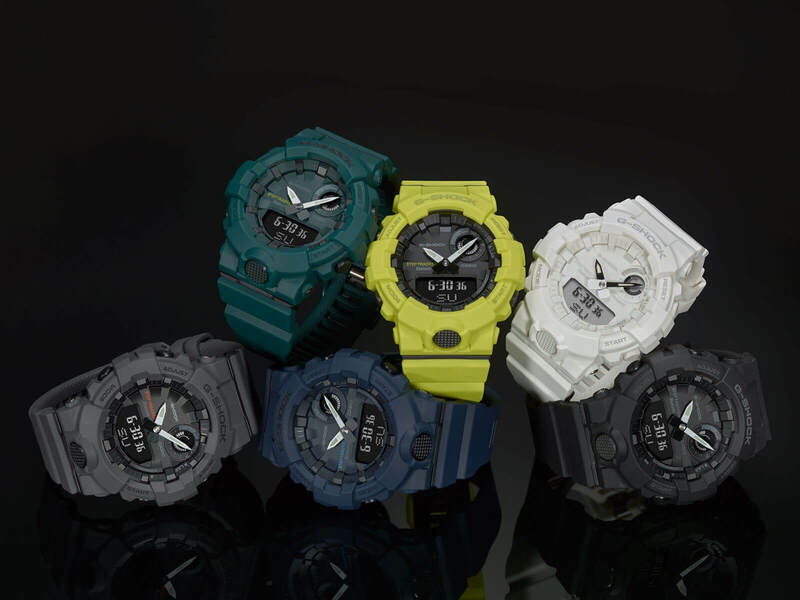 The GBA-800 has a 3-axis accelerometer and can pair with a G-Shock Connected smartphone app to track and view daily step tracking and calories burned. The app displays a graph that breaks down the steps taken into five metabolic equivalent (MET) levels in daily, weekly, or monthly views. If a smartphone is used while walking or running, the app will graphically display the steps taken and calories burned on a map. A special timer allows the user to configure five timers (up to 60 minutes each) to automatically repeat up to 20 times to create interval training workouts. The watch also has a 200-record lap memory that includes month, date, and lap/split times. The Bluetooth connection also allows the smartphone app to set dual time display settings with 300 cities, automatically sync the time four times a day, and set the time and alarms. The Phone Finder function will set off an alarm on the smartphone by pressing a watch button. At 54.1 x 48.6 x 15.5mm, the GBA-800 has the same dimensions of the mid-size GA-800. This smaller size makes it an appropriate choice for women too. Like the GA-800, the GBA-800 has a front button for the LED light, but does not have a third analog hand. The battery life is rated for approximately 2 years. 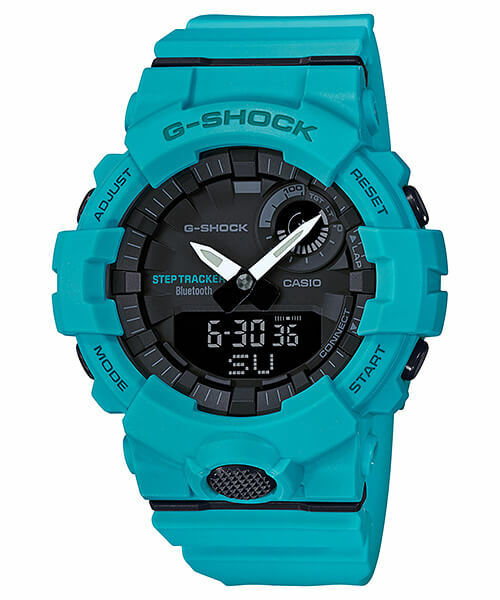 Full features include shock resistance, 200-meter water resistance, Bluetooth Low Energy, step counter, stopwatch, countdown timer, 5 daily alarms, and auto Super Illuminator double LED light with afterglow. Update: The black GBA-800-1AJF, white GBA-800-7AJF, and lime green GBA-800-9AJF are scheduled for a February 2018 release in Japan with a list price of ￥16,500 JPY each. The GBA-800-1A, GBA-800-7A, and GBA-800-9A are also a February 2018 release in Asia. Update 2: Casio America announced the black GBA800-1A, white GBA800-7A, lime green GBA800-9A, navy blue GBA800-2A, teal GBA800-3A and grey GBA800-8A. The GBA800-1A, GBA800-7A, and GBA800-9A will be released in March 2018, and the GBA800-2A, GBA800-3A, and GBA800-8A in April 2018 with a list price of $120 USD each. Update: Casio released two more models, the light blue GBA-800-2A2 and orange GBA-800-4A, in Japan and Asia for May 2018. Are these available for sale yet? The white, black, and yellow models are being released in February 2018 in Japan. Hi fellows from “G-CENTRAL”! Nice article as well! But i’m doubt about the folow information… You wrote: “At 45.2 x 42.6 x 13.3 millimeters, the GBA-800 is significantly smaller than the mid-size GA-800 (54.1 x 48.6 x 15.5 mm).” But in the CASIO website (http://www.casio-intl.com/asia/en/wat/watch_detail/GBA-800-9A/), the GBA-800 size of case is: “54.1×48.6×15.5″… What is correct? Yeah I had the wrong information. It is 54.1 x 48.6 x 15.5 and is now updated. Thanks for pointing that out. Great, thanks for solving my question! But in my point of view, if CASIO’s engineers had opted to use “Tough Solar” system in GBA-800, it would have more commercial appeal and would be a sales success! This CR2016 battery (has a 2-year shelf life only …). 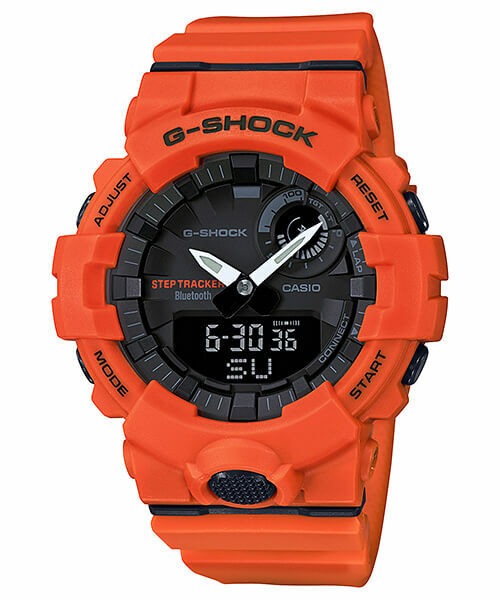 This is a watch with Bluetooth® connectivity, so “Tough Solar” would be an excellent sales trigger for the new GBA-800! But it still an nice watch! *Abraços de seus fãs do Brasil!!! !